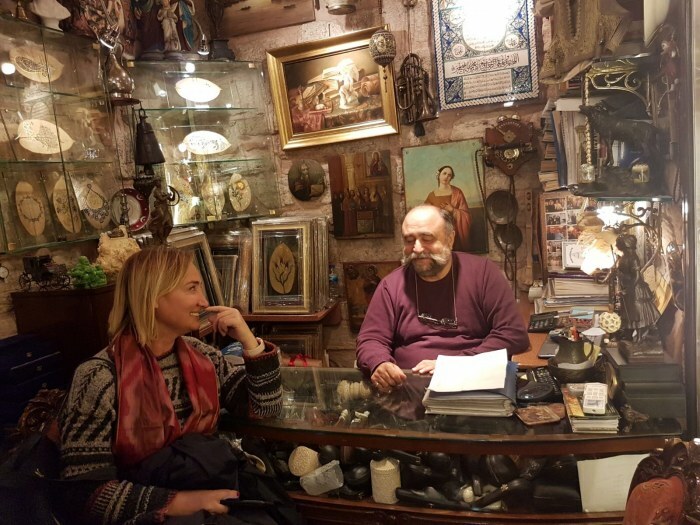 This is a tiny shop in the Grand Bazaar’s Inner Bedesten. It is not possible to notice the treasure inside from the outside. We learn that it is part of the Byzantine barn. We pass through the inner corridor while passing through a tiny place. The tiny narrow corridor is filled with newspaper clippings promoting the miraculous art of the master Onnik. There is a small antique table right in front of him. If you look under the table glass, you can see that its covered with pipes. Throughout the years, these antique pipes have been gathered together with their unique stories. The master set up a living space for himself, not an office of 12 m2. He lives with his memoirs and antique objects he collects; pipos, books, photographs, magazines, paintings, leaf scrolls and of course, their stories. There are tens of paintings with leaf illustrations, on the both side of the walls. In the shop we are approaching the man sitting behind the desk. He is Master Onnik. 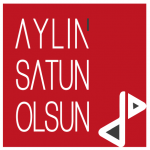 “Hello master Onnik, I am Aylin” I introduce myself, then my friend. I say “it was not easy to reach you. 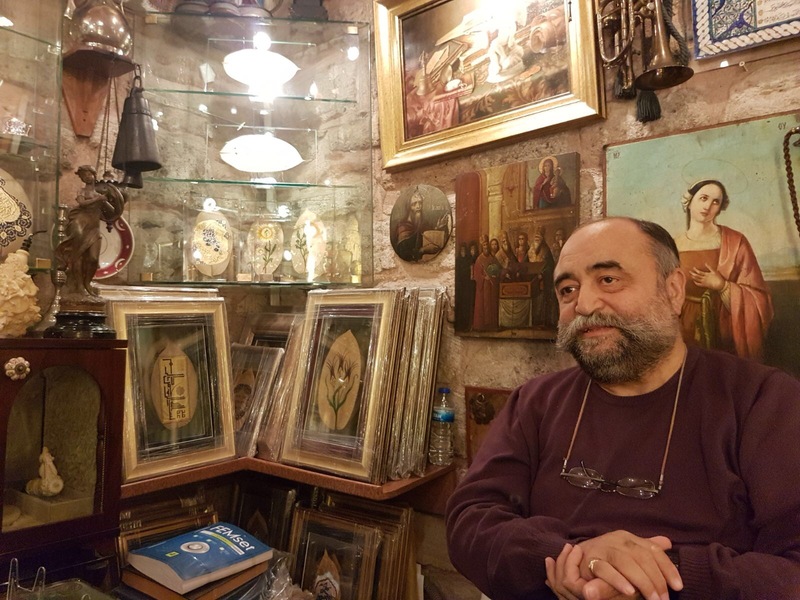 I noticed that you were not the one known as Master Onnik in Grand Bazaar.” He smiled for a while than he said : you should had asked for the “Lord of the Leaves” and invited us to sit down to the chairs. Would you get excited about shopping for a gift? Well, I am excited. I am thrilled to see the leaves first and to get to know more about the master. He takes one of the two big folders standing next to the table and takes out the thin leaves one by one and introduces his works to us. The quotations from three great books of religion were worked out together with some symbols with quotations from the thinkers; all of them have a different meaning. I wonder and asked how he started this business. So we began our deep, hours long conversation. Everything is a coincidence and a miracle, he says. Many years ago, one of the potted flowers that came for his son’s baptism fell in two leaves. He takes the leaves instinctively and puts them in the book. It’s two years from now, and one day he sees these leaves in the book. 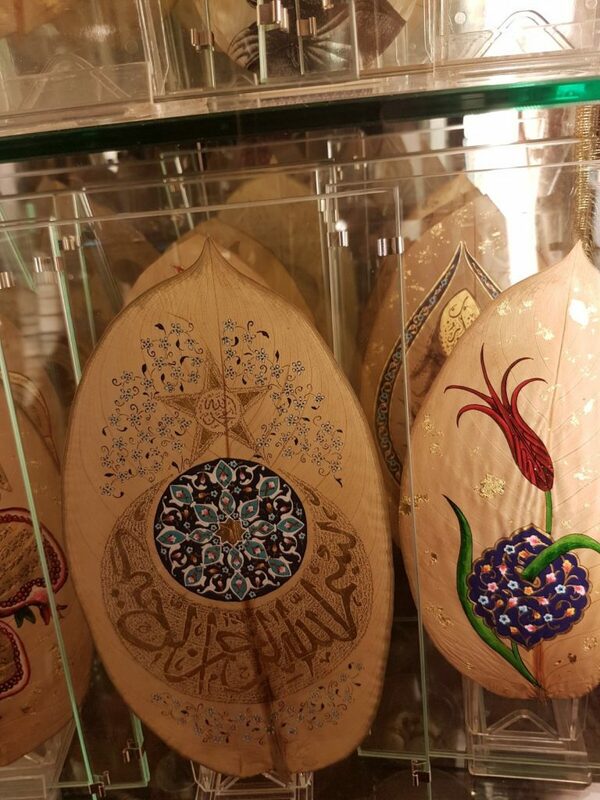 The leaves, which have a silky appearance, affects him and he asks one of his friend who made calligraphy to the skin and marble whether the leaves can be written on too. After mutual exchange of views, they design two leaves together. The leaves with a statement from Kanuni’s official sign and a quote from Yunus Emre come back to life with the touches of calligraphy master. While he’s preparing to frame them and bring them in his house, an American couple who came to the store insist on buying these leaves and convinces the master. And so, the journey of the Lord of the leaves begins. When he goes home again with an intense inspiration, he takes three plants and starts to dry the leaves again. These leaves are called “Leaves of Love and Tolerance”. With his caligrapher friend, they try to design and write on the leaves, but getting the result is not so easy this time. They realize that the leaves of other plants, other than the Difenbahia plant, which they have tested randomly, quickly break down. They now only write on the leaves of the Difenbahia plant; but when the costs of the imported plant become high, they are starting to import leaves from Florida. There are now three calligraphy masters working on leaves. Their teachers from Mimar Sinan University are making special paint mixtures for leaves. The master Onnik designs the leaves, all designs belong to him. Actually, he’s an artisan of meerschaum. You can also see giant pipettes made from magnificent weasel in his shop, but he’s mostly devoted himself to the art of leaves after this random bond between him and leaves emerges. In fact, those designs reflected on the leaves are a result of his years of mental, emotional and intellectual accumulation. I still read and dream about it, he says. He designs each leaf separately. For him, every leaf is a new birth. In fact, he always recreates himself with leaves. The fame of Love and Tolerance leaves exceeded Turkey. Master Onnik has opened exhibitions of leaves in Turkey and many other countries as well. The Kings, the Queens, the presidents of the countries have gone to his exhibitions and left with gifts of leaves, but he boasts mostly of Bill Gates, whom he learned after he came to his shop. He says: Think! Bill Gates may not have something missing since he has everything, but he loved my leaves and took them. The conversation is so fluffy that, every word that comes out of the master was so magical that I could not understand how the time passed. I decided to choose a leaf for myself. It was not easy. Then, with master Onnik, we chose the leaf ” If I abandon myself, you do not abandon me , my GOD”. Today is a lucky day for me… I have not only been able to buy a rare work from the Lord of the Leaves himself, but I have also gained a friend. Yapılacaklar listesini kenara at, 2019’u düşle! How Can We Say “No” To The Shame Economy?